A computer built by IBM and released in late 1959. The 1620 cost from around $85,000(?) up to hundreds of thousands of dollars(?) according to the configuration. It was billed as a "small scientific computer" to distinguish it from the business-oriented IBM 1401. It was regarded as inexpensive, and many schools started out with one. It was either developed for the US Navy to teach computing, or as a replacement for the very successful IBM 650 which did quite well in the low end scientific market. Rumour has it that the Navy called this computer the CADET - Can't Add, Doesn't Even Try. The ALU used lookup tables to add, subtract and multiply but it could do address increments and the like without the tables. You could change the number base by adjusting the tables, which were input during the boot sequence from Hollerith cards. The divide instruction required additional hardware, as did floating point operations. The basic machine had 20,000 decimal digits of ferrite core memory arranged as a 100 by 100 array of 12-bit locations, each holding two digits. Each digit was stored as four numeric bits, one flag bit and one parity bit. The numeric bits stored a decimal digit (values above nine were illegal). Memory was logically divided into fields. On the high-order digit of a field the flag bit indicated the end of the field. On the low-order digit it indicated a negative number. A flag bit on the low order of the address indicated indirect addressing if you had that option installed. A few "illegal" bit combinations were used to store things like record marks and "numeric blanks". On a subroutine call it stored the return address in the five digits just before the entry point to the routine, so you had to build your own stack to do recursion. The enclosure was grey, and the core was about four or five inches across. The core memory was kept cool inside a temperature-controlled box. The machine took a few minutes to warm up after power on before you could use it. If it got too hot there was a thermal cut-out switch that would shut it down. Memory could be expanded up to 100,000 digits in a second cabinet. The cheapest package used paper tape for I/O. You could also get punched cards and later models could be hooked up to a 1311 disk drive (a two-megabyte washing machine), a 1627 plotter, and a 1443 line printer. Because the 1620 was popular with colleges, IBM ran a clearing house of software for a nominal cost such as Snobol, COBOL, chess games, etc. The model II, released about three years later, could add and subtract without tables. The clock period decreased from 20 to 10 microseconds, instruction fetch sped up by a few cycles and it added index registers of some sort. Some of the model I's options were standard on the model II, like indirect addressing and the console teletype changed from a model C to a Selectric. Later still, IBM marketed the IBM 1710. A favorite use was to tune a FM radio to pick up the "interference" from the lights on the console. With the right delay loops you could generate musical notes. Hackers wrote interpreters that played music from notation like "C44". 1620 consoles were used as props to represent Colossus in the film "The Forbin Project", though most of the machines had been scrapped by the time the film was made. 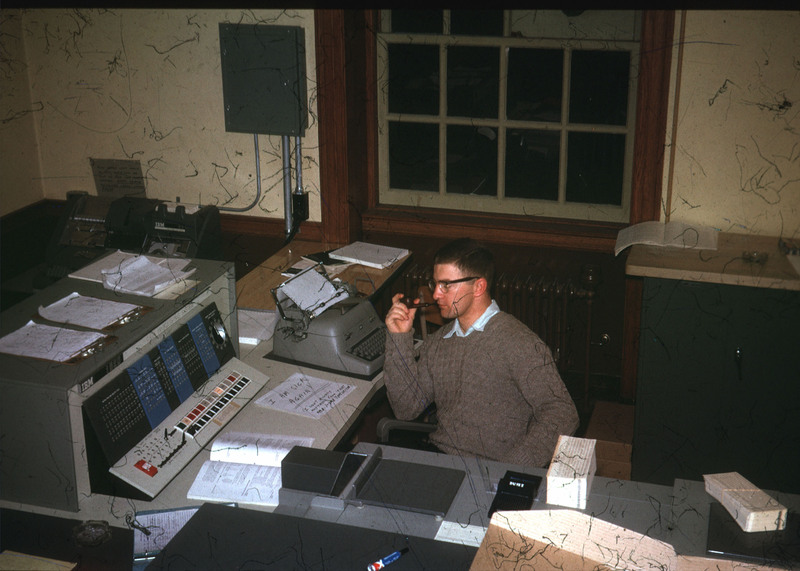 IBM 1620 at Tuck School of Business, Dartmouth College, Hanover, NH, USA (Thanks Victor E. McGee, pictured). ["Basic Programming Concepts and the IBM 1620 Computer", Leeson and Dimitry, Holt, Rinehart and Winston, 1962].